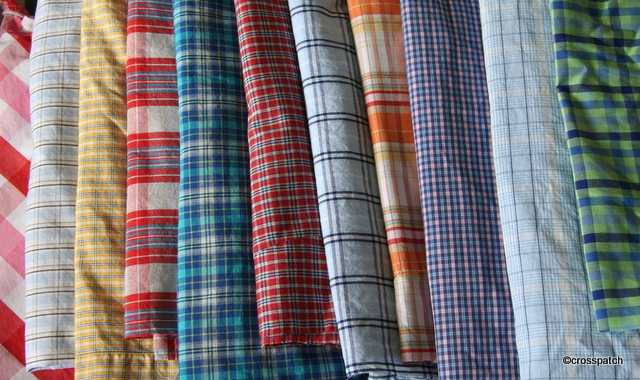 So, having cut up all my charity shop shirts I have a satisfactory pile of checked fabrics which make the beginnings of a potential new plaid quilt. I think I need some more greens and also some more deep saturated colours. 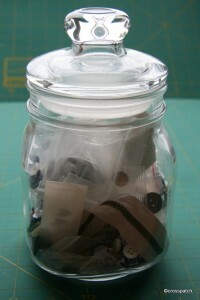 I’m going to keep collecting till I have a mix I like, and then start cutting. One secondary benefit of all those shirts is a healthy supply of shirt buttons to add to my button jar. 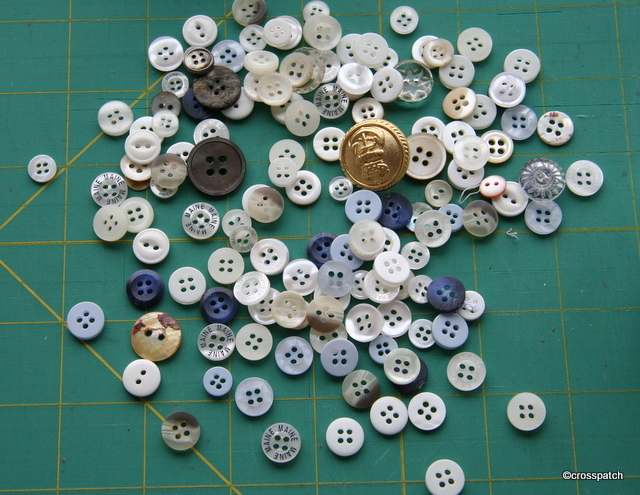 Pictured are my shirt buttons and a selection of buttons which were orphaned and hanging about the house in drawers and on surfaces waiting to be re-homed. Being a practical person, when I come home from a shopping trip with a new garment I always cut off the little plastic bag with the spare buttons in and put them carefully aside in case I ever lose a button… but I’m also a great believer of that old adage “a stitch in time saves nine” or in this case “a stitch in time saves having to replace a button” so if I see a loose button I re-stitch it, consequently I rarely lose my buttons. 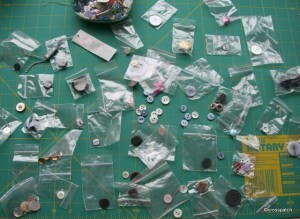 Those many little plastic bags containing buttons remain long after the garment they came with has long since departed my wardrobe. 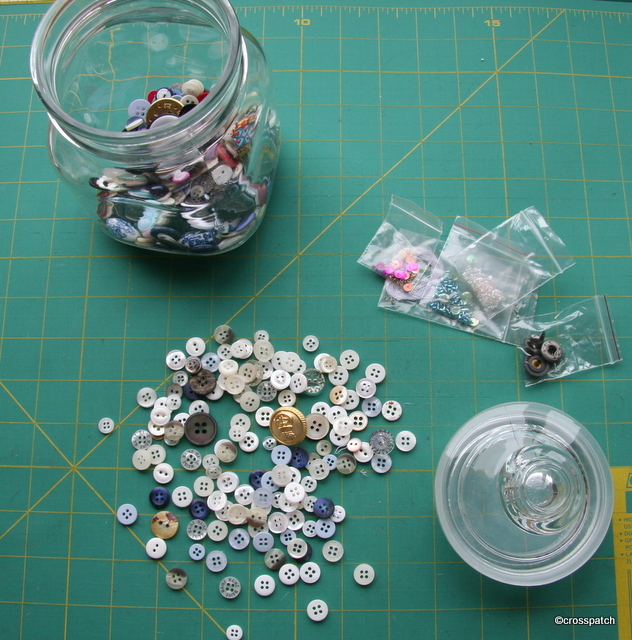 These buttons in bags have mostly gravitated to my button jar, but they do not have much to recommend aesthetically, in fact as a button jar mine was hardly a thing of beauty. Plastic has its place and I would not be without it, but it is not pleasing to the eye. 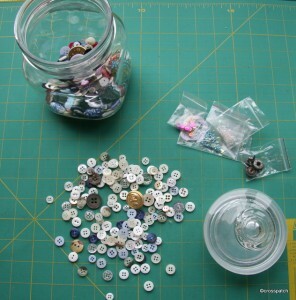 Taking as my guide William Morris, who said “Have nothing in your house which you do not know to be useful or believe to be beautiful” I want my button jar to be both useful and beautiful. I have ejected all the plastic and added the shirt buttons. It is only a small jar, and not very full but time will take care of that, grandma’s always have the most well stocked button collections and I have a few years to go yet before I will qualify, age wise. 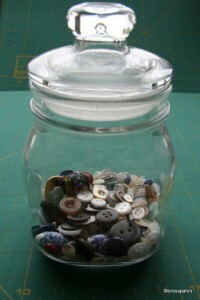 I wonder how many plaid shirt quilts I would have to make to fill the jar? 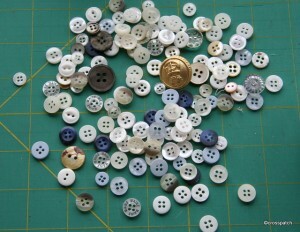 But then if I use the buttons to tie the quilt I might end up buying buttons.